End With Care is relatively new, but the underlying concept of our service and support offering is tried and tested. 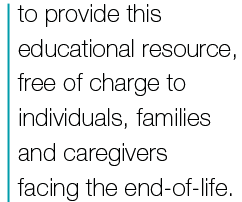 Funded by the state in 2001, the Commonwealth of Massachusetts Commission on End-of-Life Care was established. The Commission brought together a blue-ribbon group of experts to study and propose ideas to meet the increasing needs of those in the final stages of life and in need of a wide range of resources available throughout the state. The result was the development of an end-of-life content-based website offering users easy and convenient access to the most extensive listing of services and supports available within the state. Despite little formal marketing, statistics showed an average of 15,000-20,000 unique visits to the website per month. Although the Commission ceased to exist after 2006, many of its principals became part of the Massachusetts Expert Panel on End-of-Life Care. 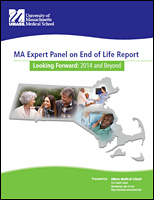 The panel’s report in 2010, Patient-Centered Care and Human Mortality, as well as the updated report, Looking Forward: 2014 and Beyond, present thorough documentation of the growing issues of end-of-life care in Massachusetts, with research citations and policy recommendations. Of particular note is the first of the report’s 6 recommendations, to “Inform and Empower Residents of Massachusetts”, with a vision that “Individuals know where to find information about end-of-life choices and resources.” This recommendation is firmly aligned with the goals and objectives of End With Care. End With Care’s Executive Director worked integrally with the Commission as the primary developer of the end-of-life website and model described above. With these direct links, End With Care is rooted to the foundation set by the Commission. Our mission is to provide this educational resource by building content from experts, collecting vital data, creating an interactive directory of service and care providers, and making it available free of charge to individuals, families and caregivers facing the end-of-life. Building on the successes of the past, we are committed to being a valuable new end-of-life resource with a goal to help those in needs improve the quality of life at the end of life.